If you follow news in the food world, then you are likely up to date on all the controversy surrounding the recent article by Time on the “Gods of Food” — it published a list of people recognized for their influence on food today, and of all the chefs who made the list, not a single one was female. To make matters worse, the editor tried to explain the reasoning behind this in an interview with Eater. In response, Grub Street came up with their “Goddesses of Food” list, 10 world class chefs who are women, and the LA Times wrote a piece on California’s female chefs. All this made me reflect on the role of women in Peruvian cuisine. Does Peru have it’s own Goddesses of Food? And if so, who are they? To answer that, I started by looking at my culinary heroes. I have a profound admiration for the work being done by chefs such as Gaston Acurio, Javier Wong, Virgilio Martinez, Pedro Schiaffano, and Martin Morales. Not because they are male, or because Astrid & Gaston has been listed as the best restaurant in Latin America and Lima London received a Michelin Star, but because these chefs are true ambassadors for Peruvian cuisine, traveling the globe to share Peru’s culinary history and its dishes with the world. But my culinary heroes also include women such as Teresa Izquierdo who is known as the mother of Peruvian cuisine, or Grimanesa Vargas who makes the best anticuchos I have ever tasted and which were praised in Time magazine’s list of 24 of the world’s best kept secrets. I’ve also been inspired by Sandra Plevisani’s award winning book on Peruvian desserts, not just for the recipes but also her research on the history of Peruvian cuisine during the Viceroyalty — a topic which I am very passionate about. Are these women chefs Peru’s Goddesses of Food? Yes. But the list is really much more extensive and impossibly large. Why? Because it would have to include every woman in Peru who has ever cooked for her family, grown crops in the Andes, opened their own food stand, or sold food at a local market. That list, would have to start with my mom and my grandmothers — the three women who are responsible for my profound love of Peruvian cuisine and who inspired me to become a chef. Yes, that list starts with them. This list grows at places such as the Mistura food festival. Here, APEGA, the Peruvian gastronomical society, awards the Teresa Izquierdo prize to women chefs. You read correctly. Women chefs receive an award named after the mother of Peruvian cuisine. 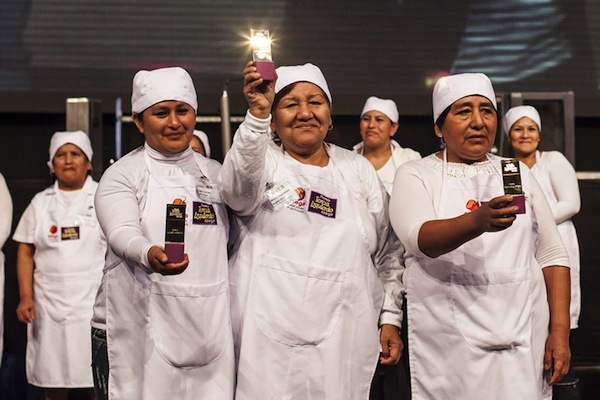 And this year, the Teresa Izquierdo 2013 award was given to three cevicheras — three women recognized for cooking ceviche in the markets and streets of Lima. And this matters more than a Michelin Star because it shows the world that Peru truly pays homage to its Goddesses of Food.